I should be studying two different scripts for three upcoming shows. Instead I'm salivating over Nanette Lepore's Spring Lookbook while wondering how long I'll have to wait for my favorite items to go on clearance sale, and admiring the preview of the Jason Wu line for Target while plotting my online shopping strategy. I'm also sharing some photos of the current bedroom decor at the 1952 House. 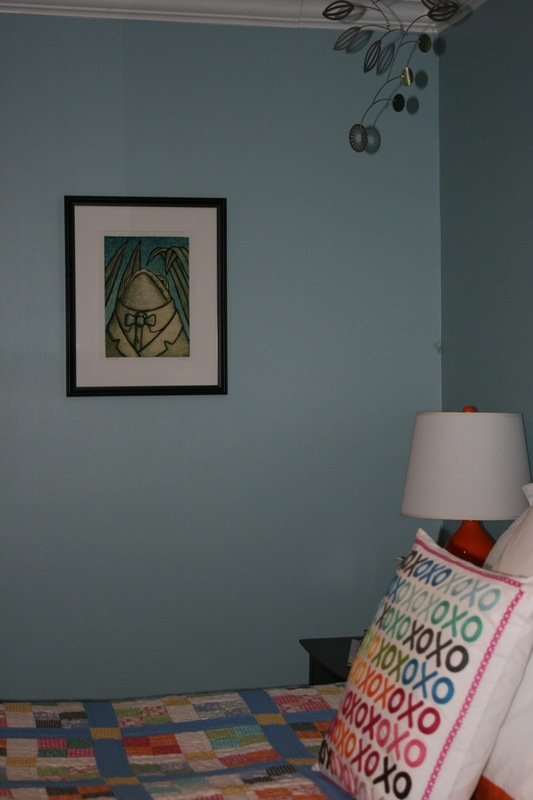 I redid the bedroom to the current colorful stuff over eighteen months ago. Before that, muted orange peacock bedding from West Elm graced the bed. I don't recall photographing, much less sharing that. Before the peacock bedding the well documented graphic brown & white Dwell bedding kept us cozy. 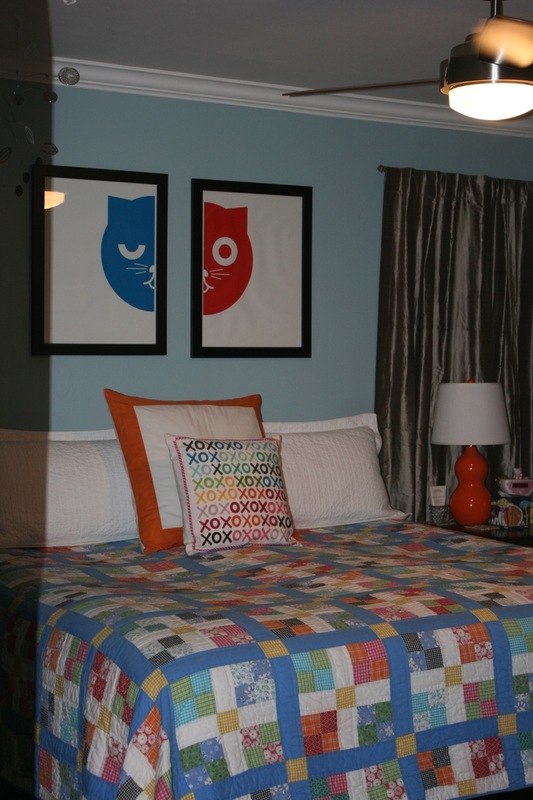 The lovely cat prints over the bed are by Medium Control print studio. 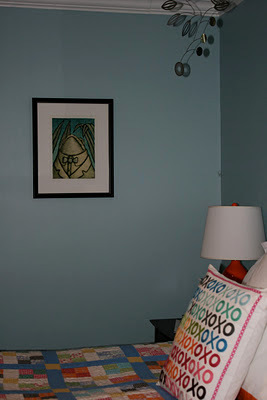 I picked up the prints at Austin's Renegade Craft Fair last spring. The quilt and larger square pillow cover came from The Company Store, but are no longer available. 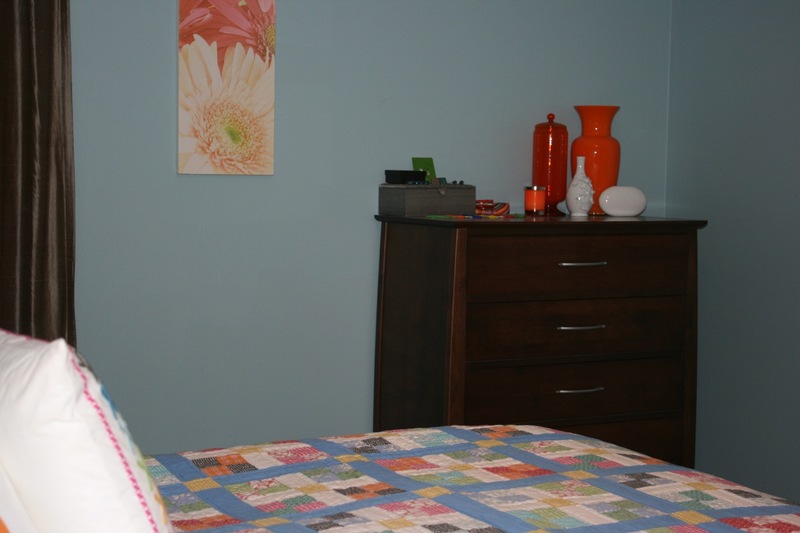 The XOX pillow sales benefited St. Jude's and came from PB Teen in the 2010 holiday season. The quilted white pillow shams are from Target. If I get a retail job at Crate & Barrel or West Elm later this month, I'll probably cash in on the employee discount with new bedding. I try to sublimate my (self-diagnosed) obsessive compulsive disorder in positive ways such as redecorating, rather than touching the oven knobs forty-eight times before leaving the house. I always launder, package, label and donate the still stylish cast-offs so that some lucky Goodwill shopper can redecorate their place. It's a win-win, really... REALLY!